The famous tasty Hong Kong Egg Waffles can be also tasted in Berlin too. Although the beginning are modest, it was about time that the hip and trend-setter city open the doors to a delicous street food treat. The honeycomb-shaped waffles with egg shaped bubbles, filled with icecream and covered by whipped cream and other toppings of choice are already a popular treat all over Europe, from Camden in London to the town of Poznan, in Poland. Let's see what I had in Berlin for now. The first and the best impression of those fantastic waffles was overwhelming because of so many topping choices and so little space in my belly to have them all. 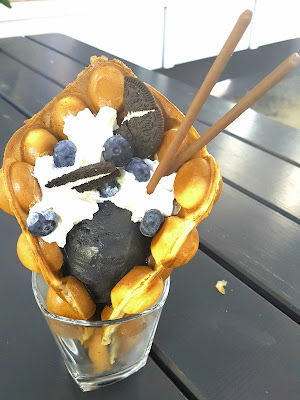 Practically, you can fast the whole day and break it with the carb-loaded bubble waffles - mine was a bit burned up on the edges - plus the icecream, plus some fruits - lychee was a perfect fresh choice - plus more toppings - that you carefully write on a piece of paper and handle with your order. Delivered with some Mikado sticks and an Oreo cake. They do have a special menu only for those waffles, and the preparation lasts around 5-7 minutes. One treat costs 4.90 Euro and it is worth every single cent of it. Zuka is my favorite sweet corner in Wilmersdorf, both during the summer - where you can sit on the benches - or the winter. I am trying to go there at least once the month, for their perfect looking and tasting Macha latte and their exquisite desserts. The last time I've been there I noticed that they introduced the Hong Kong waffles on the menu - at the price of 5 Euro -, at least for the summer time, and hurried up to try them. After the previous experience, I was a bit disappointed, because it is completely experimental and limited in topping choices. The dough is tastier, and they do have some interesting icecream choices - my black one isn't sesame as expected, but black vanilla which honestly doesn't sound different of a normal vanilla, except the colour - but otherwise there is not too much to juggle in terms of creative tastes. With only two limited choices as for now, I hope that the winters are long enough to allow the waffle experts in Berlin to consider introducing those beauties on their menu. The stronger the competition the better. wow I hadn't heard of Hong Kong Waffles! Let look amazing!